Tarangire National Park is rapidly becoming isolated from other national parks and wildlife dispersal areas as a result of human encroachment. Three of seven main migration routes linking Tarangire and the surrounding areas in the early 1960ís have disappeared entirely, and all others are now threatened by increased civilization. Yet Tarangire wildlife depends upon access to this land, especially the mineral-rich dispersal grounds outside of the Park. This project aims to identify the main migration corridors and dispersal areas for bull elephants within the Tarangire ecosystem by tracking three bulls elephants using GPS radio collars, and validating these data by conducting intensive surveys on the ground. Little is known about the movement patterns of the Taragire bull population. The majority of the large breeding bulls leave the Park for much of the year, returning only during the main breeding season, yet it is unclear where these individuals spend their time. 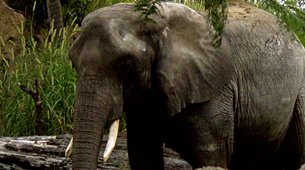 Circumstantial evidence suggests that they disperse widely, and might be migrating between different elephant populations in protected areas within the ecosystem, possibly reaching as far as the Ngorongoro Highlands. The result of this study will be a spatial analysis that details exact elephant migration routes within the ecosystem and highlights dispersal areas. This will be used to guide future land conservation efforts within the Tarangire ecosystem, and ensure the protection of at least some of the main migration routes of the Tarangire elephant population before they are lost entirely through human encroachment.